A shrimp is a crustacean similar to a prawn. They live in salt water or brackish water. They are smaller than prawns, have shorter legs and have branching gills. As prawns, shrimps are harvested for consumption. They are high in calcium, iodine and protein. 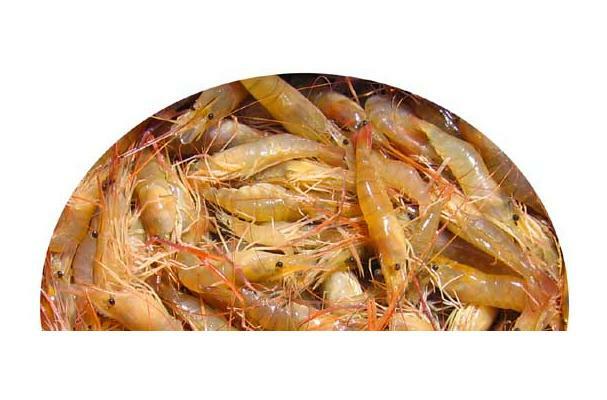 Shrimps are versatile ingredients and can be cooked by boiling, baking, steaming, or frying. Shrimp typically have two pairs of claws, and the second segment of the abdomen overlaps the segments on either side. The abdomen shows a pronounced caridean bend. Common shrimp species include pink, brown and snapping shrimp. Choosing: Select firm shrimp with a mild scent. If there is any hint of the aroma of ammonia, it is a sign the shrimp is way past its prime. Some may have spots, an indication of poor handling. Commercially-sold shrimp is defrosted, in which case the flesh will appear opaque. Truly fresh shrimp will have almost translucent flesh. Buying: Most shrimp are sold frozen and marketed based on their categorization of presentation, grading, colour, and uniformity. Procuring: Today, the US harvests over 650 million pounds a year, more than any other country. And still this is not enough to fill the need, in spite of shrimp-farming. The US imports yet another 200 million pounds a year. It is a popular ingredient in appetizers, salads, chowders, and, of course, as a main dish. Cleaning: Preparing shrimp for consumption usually involves removing the head, shell, tail, and "sand vein". Cooked shrimp can be stored in a sealed bag no more than 3 days in the coldest part of your refrigerator. Both cooked and raw shrimp may be frozen, but freezing raw preserves a better flavor. Raw shrimp can be frozen with shell or without, but should have the heads removed. Raw frozen shrimp will last 6 months in the freezer while frozen cooked shrimp should be consumed within 2 months. Commercially-frozen raw shrimp will last longer in the freezer without deterioration, since they are flash-frozen fresh with little handling. Frozen cooked and uncooked shrimp should ideally be thawed in the refrigerator in advance of need. They can be added frozen to casseroles and baked dishes. If you need to quickly thaw, you may put the shrimp under cold water, not warm. Warm water will begin the cooking process. History: The word shrimp comes from the Middle English shrimpe, meaning "pygmy" or a reference to the crustacean itself. In the 7th century, shrimp and other seafood composed the majority of the Chinese diet, and still does today.